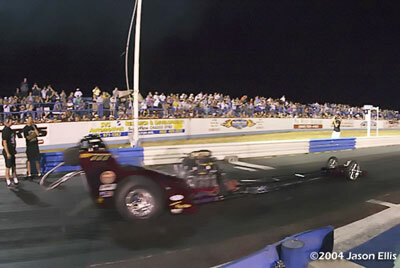 In spite of extremely hot weather and tricky track conditions it looked like the OSH-WW2 Racing team was back on track at the 2004 Night of Fire race at Sacramento. Murphy qualified in the # 1 spot with a 6.08 and set Low ET of the meet in the semi finals with a 5.853 @ 254.90 (new track record). But in the final round their lack of regular crew members and hectic pit work cost them when an oil line wasn't tightened and the resulting leak forced Murphy to shut the car off after the burnout and watch Lee Jennings Sr. make a single for the win. 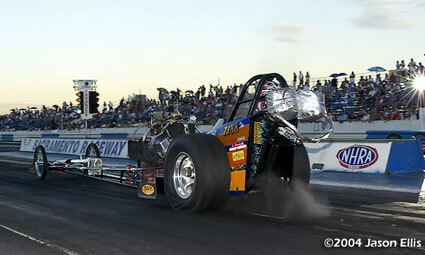 A huge crowd braved near century-mark temperatures for great racing action at the Nitro Night of Fire. 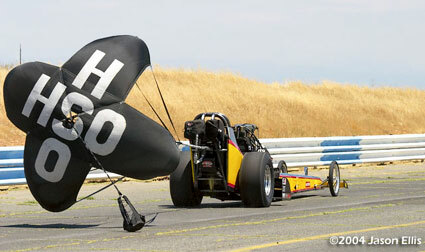 The weekend featured just about every kind of drag car one can think of including jets. 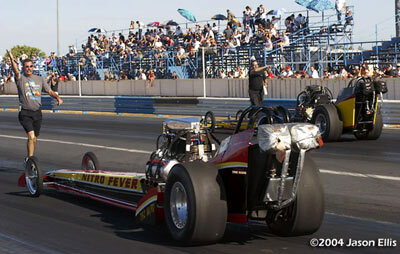 But the headliner is always the Nostalgia Top Fuel dragsters. We apologize for the lack of photos from this event as there was only one photographer shooting. Qualifying was held in the heat of the day and it was HOT! Murphy managed a 6.08 at just 206 on this second attempt. 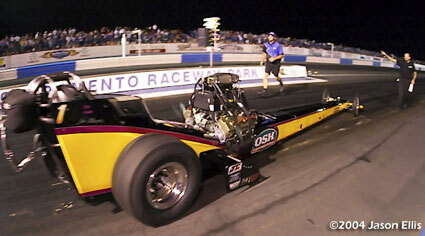 Round one of eliminations paired the OSH-WW2 Racing entry against Jason Richey in "Nitro Fever". Richey smoked the tires at the hit. Murphy clicked it off early after getting out of the groove and really close to the guardrail. But his 6.159 @ 194.95 was good enough for low ET of the round. Standing room only crowd at Sac. 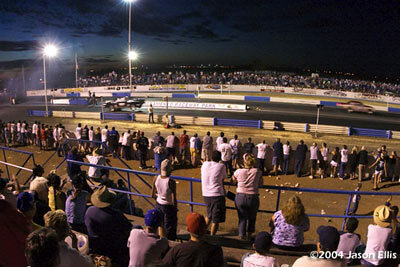 The second round came at dusk when the air was cooler and so was the track. To this point nobody had run in the fives but Murphy promised a five (if he could keep the car straight for the full run) this round. He delivered big time with a track record speed and low ET of the meet (5.853 @ 254.90). Murry made the second quickest run of the event (6.10 @ 238). Murphy and crew (which was short two people) had to do some serious thrashing between the semis and final. 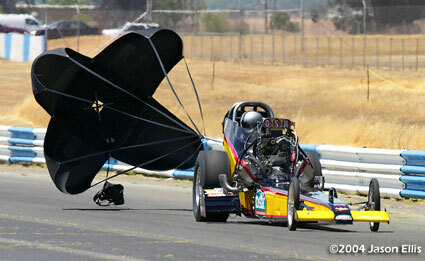 It seems the huge run they made in the previous round caused some internal engine damage. 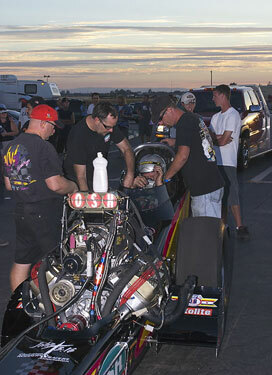 Murphy hurt parts on the 5.85 and was late getting to the lanes. 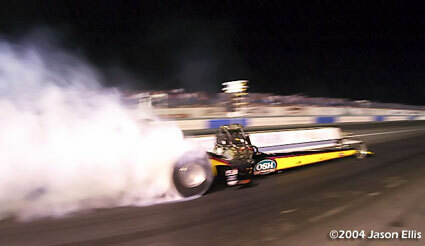 He made a good burnout but developed a significant oil leak backing up and was shut off. Jennings left strong but began to move around at mid track and shut off for the gimmie win leaving the dejected OSH-WW 2 Racing crew left to watch.